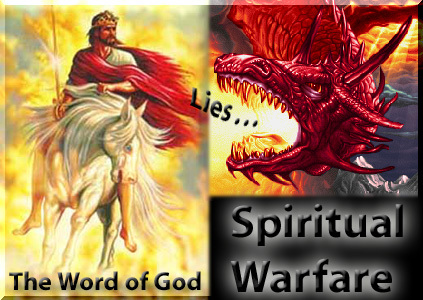 Understanding Spiritual Warfare! The Battle within and the Battle without! (Ver 1.3) This is “Part 1” in a series of lessons on the subject of “Spiritual Warfare”. This is a new subject for me and a lesson designed for the benefit of those who have been attacked by Satan and do not understand why it has occurred or what to do about it to keep it from happeing again. Many new Christians are immediately attacked and persecuted because Satan wants to stop God’s Word from developing in their spirits and becoming mature and fruitful. New Christians are the most vulnerable and usually do not know what to do about this and do not generally understand why God even allows this to even happen to them. There are many complex factors involved in understanding this problem and I will attempt to at least give you an overview of what is happening in the spiritual realm and why it can occur and what you can do to overcome it. Within any battle that we face it is always best to first recognize that we are in a battle. Not knowing that we are in spiritual battle is the number one reason why Christians do not fight the enemy. This is the basic fact that allows us to prepare and face this enemy that we cannot see with our physical eyes. Since we are born physical beings on this planet and we grow up dominated by our flesh realm senses we are forced to learn about the reality of spiritual things in order to become effective in this hidden unseen realm. Too often we find that our senses rule our world and guide our lives. If something hurts you physically you learn not to do that anymore. If something feels good or tastes good you learn to do that again. However there is an unseen part of you that is the real you and this being is your spirit inside your physical body. If you are a Christian this is where God resides also. The spirit world is more real than the natural world the Bible says. God tells us that the natural world is “temporary” and the things that are unseen in spiritual world are those that will be eternal (2 Cor 4:18). One of the first things that you need to understand is that we are in a spiritual battle and not a physical battle. People many times want to protest abortion clinics or homosexual events and act like this is doing some good. These people who are doing these ungodly things are just deceived individuals who are being guided by spiritual forces that are behind them. Therefore, your picket signs and protests are not doing anything to solve the real spiritual problem. It is like a doctor who is treating the symptoms and ignoring the cause of the disease. Your focus is on the wrong things. You can clearly see that God tells us that we are in a war. However God does not tell us that it is a physical war with guns and swords. We as Christians should be fighting this war differently than people in the world fight wars. This is the greatest deception that Satan has over many Christians, they are focused on external things and ignoring internal things. God tells us in this verse that “terrorism” is not our war as Christians. The United States has been in a war against terrorism for almost 10 years now. We will never win that war with guns. If you go and kill a few terrorist, there are soon 10 more to take their place. This is because of the spiritual forces that are backing them. God tells us that we have spiritual weapons of war at our disposal. However, God tells us that these weapons are clearly NOT physical weapons like guns. Your gun will not do you any good against a spiritual enemy that you cannot see. Satan has too many ways of fighting you supernaturally and no physical weapon will do you any good against these spiritual war techniques used by Satan. I recently heard about a man in the U.S. that was obtaining natural guns and weapons to help Jesus fight the devil when Jesus returns. This man’s ignorance of spiritual things will only make Christians appear as extremist fools to the world. Let me give you a scripture that informs us when this spiritual battle that I have been talking about begins. God again commands us (Christians) to put on His armor so that we can fight and win this spiritual battle that we are clearly in ALL together. I want you to go and read 1 John 1:5. This verse declares that God is Light and in Him is no darkness. Therefore when we put on God’s armor we are putting on the armor of Light. Do you understand this? Satan is the devil and the lord of the darkness that we are arrayed against and it is clearly not the people of this world that we fight against. However Satan does use people to get to us and we may talk about that in more depth in the future. This verse in Ephesians teaches s me why killing terrorist is not the complete answer to our evil problem in this world. You see God wiped out everyone in the world 4500 years ago in the flood of Noah except for 8 righteous people and because we still have Satan in the world, evil and wickedness is almost as great as it was in the days of Noah. However, do not make me out as a pacifist either. I believe that we must defend our country with guns and weapons at the same time that we use these spiritual weapons of God to attack the root causes of the problem. If you want to be a pacifist you will soon discover that evil doers will not be afraid of coming to your city to do you harm. The first weapon is the weapon of truth. This means you are at least required to learn the truth. Only by you knowing the truth, will you not be easily deceived. To know the truth is more involved than you just reading your Bible. It requires you studying the Bible and you digging into the deep things of God’s Word. You can very easily know some basic truths and not understand the more advanced things that will get you out of the jams that you are in right now. Learning always starts with reading, but study is necessary to gain understanding. Only by you gaining understanding can Satan never steal the truth that is in you. The next weapon on the list is called the “breastplate of Righteousness”. This first involves you knowing who you are in Christ. You need to go through your Bible and read the New Testament letters written to the church and see what you have and what you are in Christ. Christ is your Righteousness! It is only by His Righteousness that we have any righteousness. Go through the letters written to the church and learn and memorize the words that say “In Christ”, “In Whom” and similar words of association. This will help to identify your position and the free gifts of association being given to you as an heir of salvation. Every weapon of our warfare if you haven’t noticed goes back to the Word of God in some form or fashion. God’s Words are always at the root of everything that we do, say and live. I think I said this already, but the spiritual battle is over the Word of God being resident in you. Look at this verse speaking of your feet. God says put the “Gospel of Peace” on your feet. The Bible tells me that God waits for His enemies to be made His footstool (Heb 1:13, Heb 10:13). Where are God’s feet in the earth today? These feet are in the Body of Christ who is the church and the spirit of God is within us. So if God is going to “bruise the head of the serpent Satan” with someone’s feet today, how is God going to do that? This verse written to the Church informs us that it is our feet that God will use to bruise Satan’s head before Jesus returns for us. This implies we are to go out from this world as victorious. How is the God of Peace going to do this? Only by us putting the Gospel of Peace upon our feet will He do this. You can see that we are back to the Word of God again. The Gospel of Peace is certainly the Word of God being preached to the world. The message of salvation, the message of deliverance, the message of emotional and physical healing and the message of safety. These are key definitions of the Greek word “Sozo” (G2982) that is translated as “make whole”, “save”, “deliver” and “heal”. The next weapon in the Armor of Light is the shield of Faith. This is supposedly the most important weapon to defend off the satanic attacks. Faith is probably one of the top three subjects to study in the Bible in my opinion. But, what is Faith? Faith is based upon believing the Word of God. So we are again back to reading and studying the Bible. The Bible tells us that “Faith” comes by hearing and hearing comes by the Word of God” (Rom 10:17). When the devil attacks you God says you should be firmly grounded in the Word of God for all of your defensive armor of God. We can now look at the final two items found in the Armor of Light and one of these is the only offensive weapons we possess if you exclude the Gospel of Peace on our feet. To take the helmet of Salvation means to “receive” salvation which was freely given to us. I’ve aready told you the definition of “salvation” from the Greek. Again we are back to the basics of the Word of God. You heard the Gospel which was the Word of God preached for Salvation and you accepted it and believed the truth and now you are saved. Finally, the last weapon is called the Sword of the Spirit and this is plainly called the “Word of God”. You have to study the Bible to figure out what this means. Jesus said the “Words that I speak they are Spirit and they are Life” (John 6:63). So the words that Jesus spoke were the Sword of the Spirit from his mouth. In Revelation 1:16, 2:16, 19:15 and 19:21 Jesus is described as having a sword coming from His mouth that He uses to eliminate those that oppose Him in the end of the world. We can clearly understand that this symbolic sword represents the Words of God being spoken. To take the Sword of the Spirit in our armor means to speak what God has written in His book called the Bible. When you speak the Word of God your words carry the same power as if God spoke them. For example, if someone is coming against you in an attack, you could say “No weapon formed against me will prosper” (Isa 54:17). This is putting the Word of God in your mouth to counter what Satan is trying to do against you. You do not go up and say this to a human being, remember they are not your problem. You say this in the privacy of your home to Satan who is the root cause of the attack. Do you understand this? The very next verse in this context is also a key part to the successful spiritual fight that you are in. When immersing yourself in the Word of God you also pray the Word to get God’s wisdom and assistance on the matter you are facing. This next verse in Ephesians says “Praying Always”. That means never ceasing to pray. Pray when you study the Bible, and pray when you are not studying the Bible. There should not be a time during the day when you are not open to pray to God or open to hear from God. I have been doing a series of lesson on Angels and today I stopped that to answer a reader who was being attacked by Satan. But, there are multiple times in the Bible, where God sent angels only after people prayed. This means that if they had not prayed, there would have been no angels sent. I believe prayer is an essential part of your continuing relationship with God. This verse also places special emphasis on a particular type of prayer that is called “Praying in the Spirit”. This of course is not a popular subject in some churches in America and they have no clue what this even means. Some think it is just an extra praying with added emphasis, ability or time. However, this is not what it means. Praying in the Spirit is praying in tongues and if you have never done this you are missing out on one of the most powerful ways that God has to communicate through you the perfect will of God. You see God is smarter than you are and since you do not know everything and do not know how to pray perfectly in every situation that you face, God gives us a method that will never fail. You of course have the choice to not believe me and do it your way and remain at the level that you are at right now. However, if you want more of God and to know Him better, then ask Him to fill you with His Spirit and see if it does not radically change your life, like it did mine. The Shield of Faith (Rom 10:17 Faith comes by hearing the Word of God, there get faith in God’s to build your shield). Helmet of Salvation (By grace ye are saved through faith Eph 2:8 again pointing us back to hearing God’s Word). 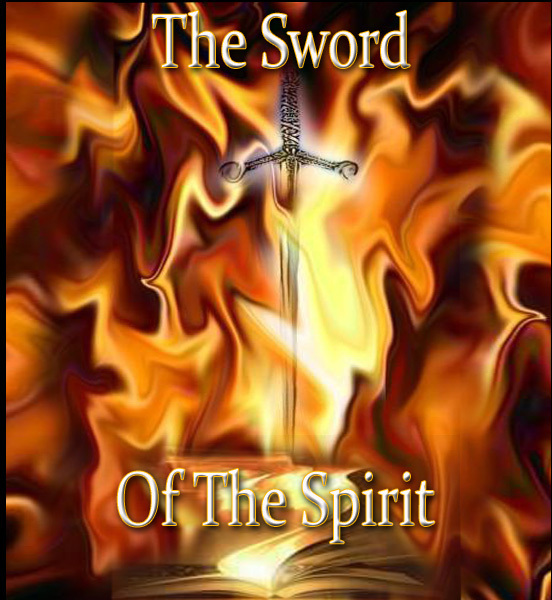 Sword of the Spirit (plainly defined to be the Word of God). Understanding that you are in a spiritual war is the first place that you need to arrive at. Understanding who your enemy is, is the next place to step up to. The next thing is for you to take up the armor of God that you has been given to you and make good use of it. The next thing that you should clearly understand is that the Battle is all about the Word of God. Satan is attacking you to take the Word of God from you. If he allows the Word of God to get in you, then you are an extremely dangerous person that can use this Word to come against him. Therefore, spiritual warfare is fought with spiritual weapons against a spiritual enemy. Finally praying is another key element to the spiritual fight that will allow you to be successful in life. I hope and pray that I have given someone out there some level of help in what they are facing in life today. It would be the greatest testimony of all if I can do that alone. God Bless! Posted on October 12, 2010, in Bible Study, Spirituality, Understanding and tagged angels, Bible, Christianity, Church, God, Holy Spirit, Interpretation, Jesus, Religion, Revelation, Salvation, Satan, serpent, Truth, understanding, Words. Bookmark the permalink. 13 Comments. God bless you keep walking with him. I have been blessed through your obedience. Thank you for being a blessing and responding to your calling. You are welcome. God Bless you and thank you for the kind comments. I am going through spiritual warfare at home, at my job, and with my best male friend. This has certainly enlightened me more that I am in a spiritual warfare and we do not speak to people but to the enemy–Satan has desired to shift me but the Lord prayed that Peter’s faith fail not. I will pass your lessons to other Christian believers. Here is the greatest spiritual battle going on in the church(es) today. Every version of the Bible except the King James Version leaves this portion of the verse out, (that Jesus Chris is come in the flesh.) We have allowed the spirit of the antichrist to come in to the church by bringing in ungodly, unholy version of the bible. MANY THANKS FOR INSPIRATIONAL EXPLANATION. I CAME ACROSS THIS SIDE FOLLOWNG THE DEATH MY TWO BROTHERS IN WITHIN 10MONTHS, AND IT IS SO THROUGH. I HAVE LEARNT A LOT FROM READING THIS PASSAGES FROM THE BIBLE AND THE INTERPRETATIONS. Thank you for being a blessing and for taking the time to study the Bible. May God bless you and cause you to grow full in all of the knowledge of Him and His Word. Thanks for your comment! Be Blessed today in growing in the knowledge of God!